The ideal all rounder for your cleaning force, opt for our Lemon Cream Cleaner. Supplied here in a large pack of 12 bottles for busy environments, this hard working cleaner cuts through dirt, grease and grime to leave every single surface sparkling. It is best used neat, and can be quickly squeezed onto your soiled surface before being wiped off with a suitable cloth. In purchased areas, a simply buff will bring your surface back to it's shimmering finish with a non-mark design that promises to leave no residue. The entire formulation has been infused with a fresh and zingy lemon scent that creates a clean and pleasant smelling environment with an easy-to-use design that is suitable for all skill levels. 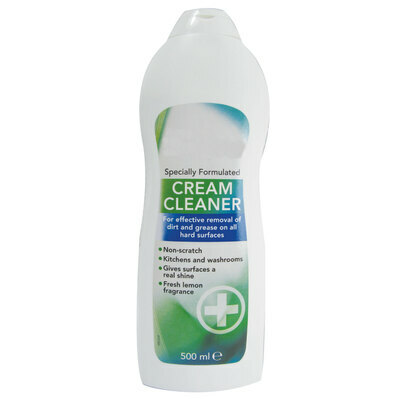 We also stock this Cream Cleaner in a single pack for all replenishment purposes or for smaller work environments. Our Soclean Wipes are also a great option for buffing up surfaces once clean.